These style are soft and feminine while being formal enough to wear to any special event. These are great examples of perfectly balanced up-styles. This style is more organic. The photo on the left has less body in the fringe area than the the photo on the right. 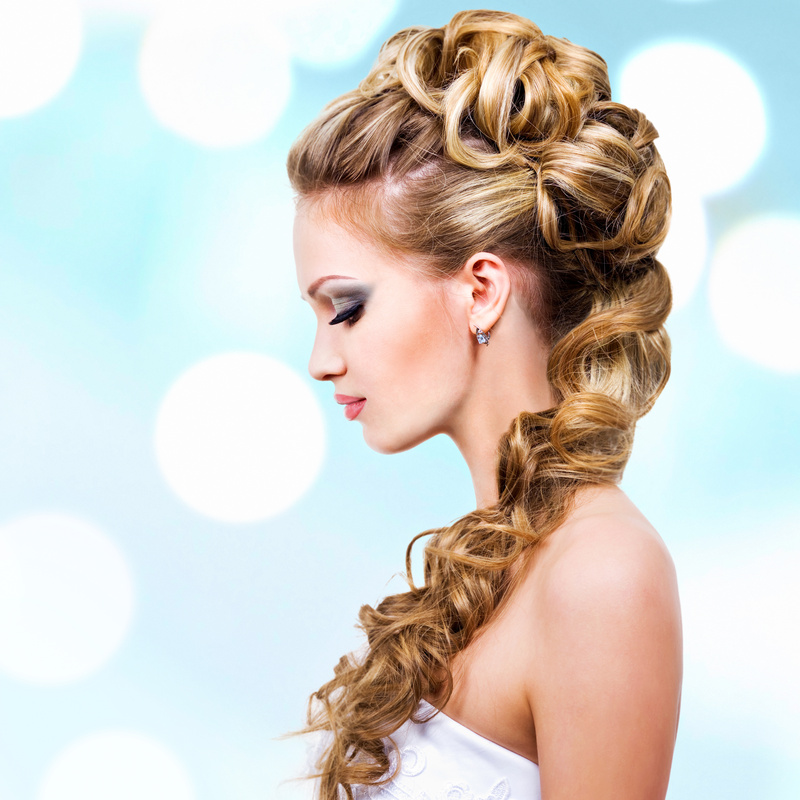 This beautiful up-style is perfect for weddings. It is very soft, yet polished enough for formal events. If you are entertaining the idea of something bold, take inspiration from this glamorous style. 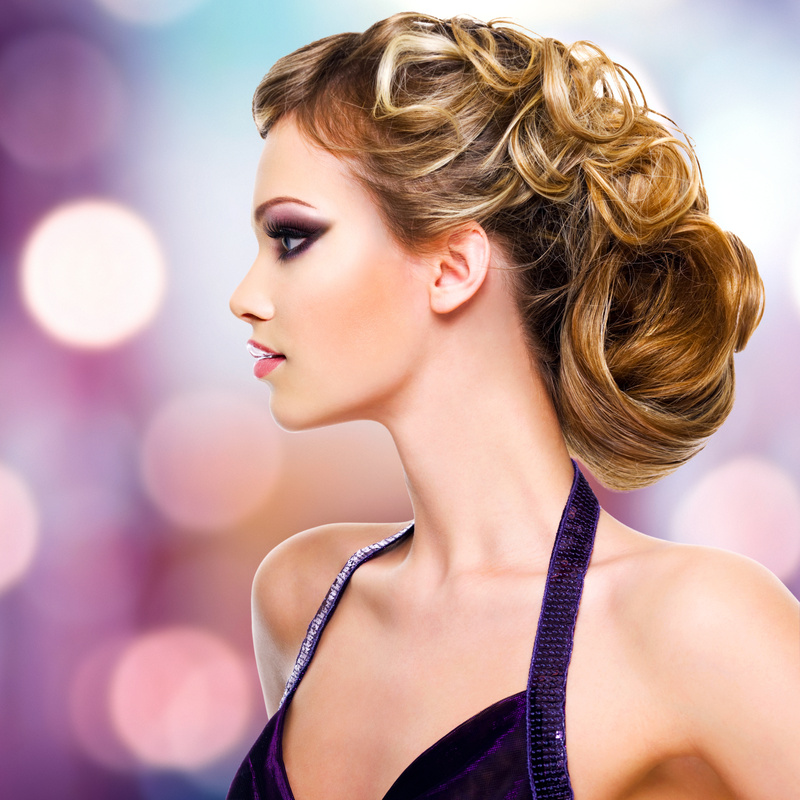 This style mimics classic hairstyles and shapes the models face beautifully. This week we want to highlight some elegant touches that are sure to create a stunning vintage style. We like to use soft accents, which boast an aura of femininity. Please enjoy! The hair for this type of look can be worn up or down, but we have chosen to highlight these beautiful up-styles because of their adaptability when working with all different textures and densities of hair. Soft curls are strategically pinned to showcase the shape of the curl pattern. We love the accent hairpiece placed asymmetrically, although this style is beautiful with birdcage and traditional veils as well. Beautiful soft pinks and oranges for the lips and cheeks, and neutral tones on the eyes keep this look soft and natural. 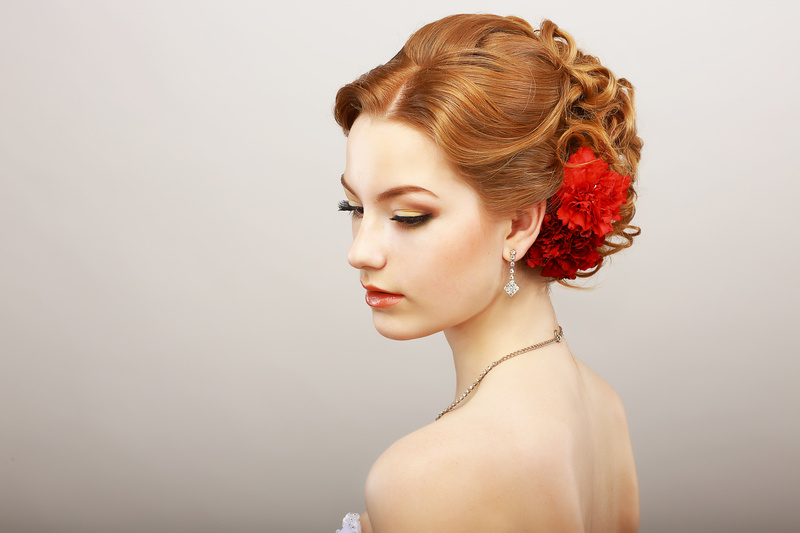 The rose colored lip looks beautiful with ivory wedding gowns. 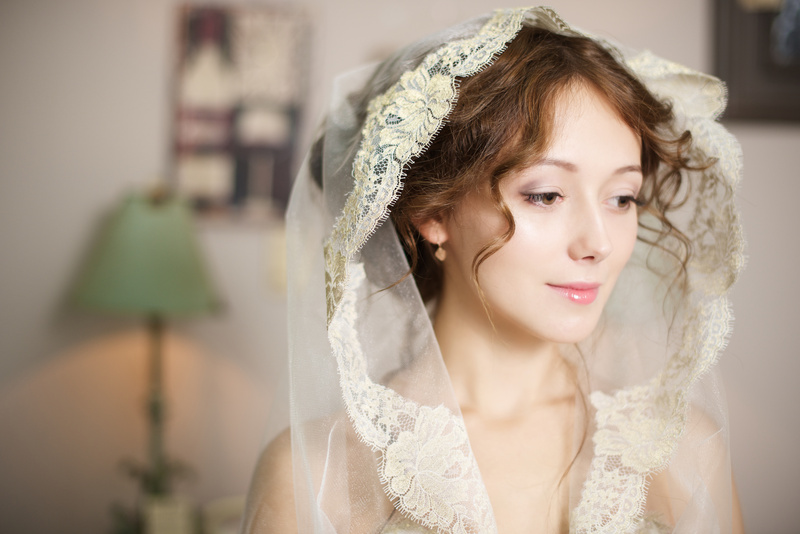 An easy way to achieve a vintage feel to your bridal style? Lace! We love gowns and veils that are accented with lace trim, or in the case of the photo, gowns made completely of lace. Trumpet style gowns are a popular cut for this look also. When designing a bouquet to fit you vintage style, be creative! 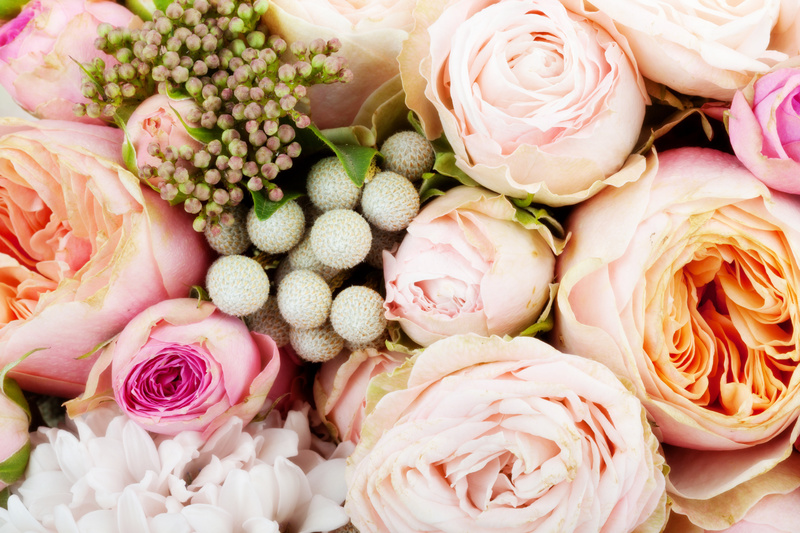 Ask your florist to help you choose a variety of flowers that will compliment one another. We like pale colors in vintage style bouquets. Think pale greens, soft pinks and oranges, and lilac/lavender tones. 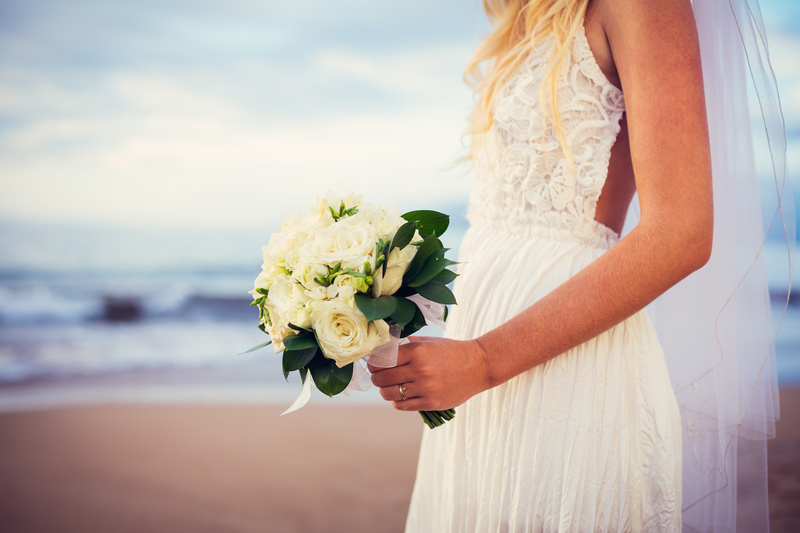 Wedding styles are not a one-size-fits-all kind of affair. The key to designing a beautiful bridal look is to take influence from the styles that the bride naturally gravitates towards, and incorporate tasteful touches of their style into a look that compliments the brides’ desired features. These features can include the dress, a piece of jewelry, the hair, or even a bold lip. Please enjoy this beautiful, natural bridal look. We love this soft, effortless style. The model is wearing a center-part in the hair, but using a side-part or no-part is an option as well. You could dress these curls up a bit more, depending on the desired effect. Looser curls are more appropriate for a more relaxed feel. 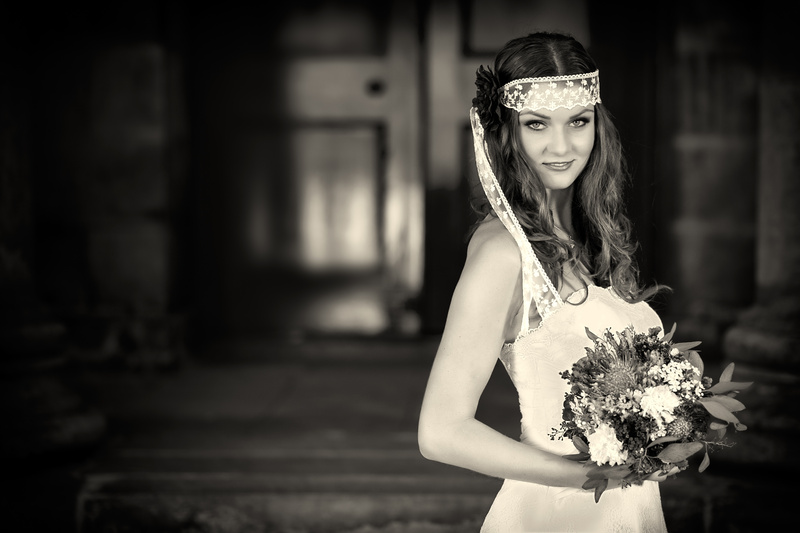 Recommended head dresses include, lace headbands, nature-inspired crowns, and fresh floral accents. 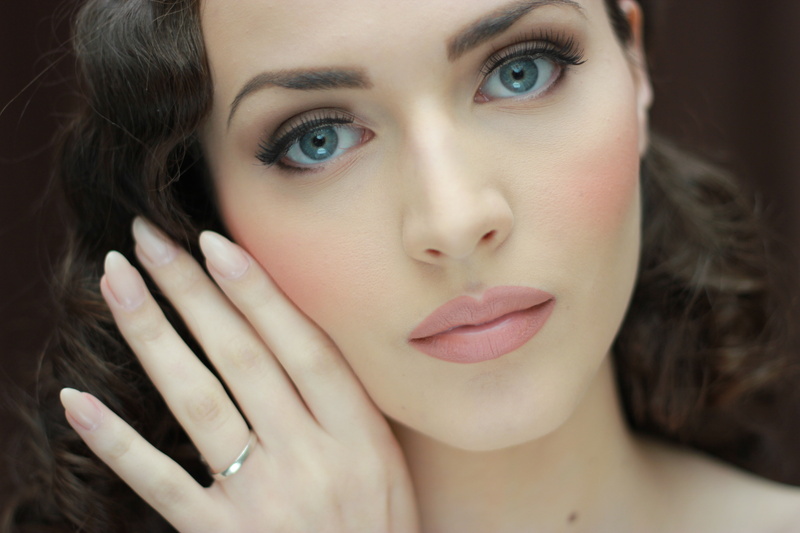 Soft natural makeup is the best complement to this look. The hair is very soft and natural as well, so for proper balance, try playing up the eyes or lips. 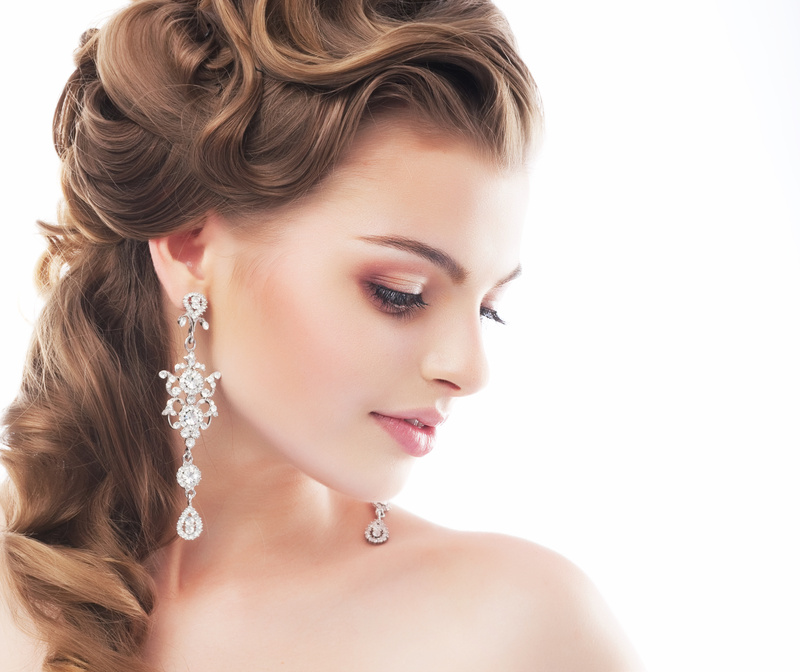 Staying within a neutral color palette will ensure that the makeup does not overwhelm the relaxed style of the hair. This dress does not offer embellishments and the overall finish on the dress is quite matte, as opposed to a satin or lace finish. These little details work harmoniously with the hair and makeup to inspire a timeless, elegant, and naturally gorgeous style. This dress is simply but extremely elegant. Less is sometimes more when it comes to effortless beauty. Notice the beautiful crochet detail. Check out more bridal styles by Valentina D’ Angela next week!